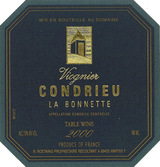 In Condrieu, René holds a 2.5-acre parcel in La Bonnette (just behind Georges Vernay's Coteaux du Vernon) that yields some of the region's most refined Viognier. Generally, he produces at most 200 cases of this wine, making it truly an insider's secret. Normally, about 60% is aged in stainless steel tank, with the balance in oak casks, but like everything else, René's choice changes with the particulars of each vintage. It is put through full malolactic fermentation, and bottled with only a light filtration.